Affordable Flawless Pin Up Girl Skin? Pin up skin is where majority of the fuss happens. If you are into Pin Ups you must have already noticed that it all starts with perfect, flawless skin. Not only on your face either, but over your entire body. 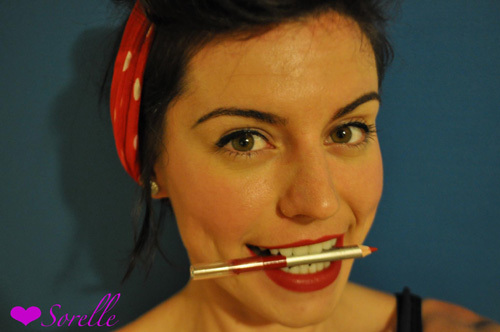 Pin ups generally wear a lot of makeup and you could be excused for thinking that you can just cover everything up. It's near impossible to try to hide imperfect, blemished, dry, uneven skin, even under layers of foundation. A smooth canvas is vital. 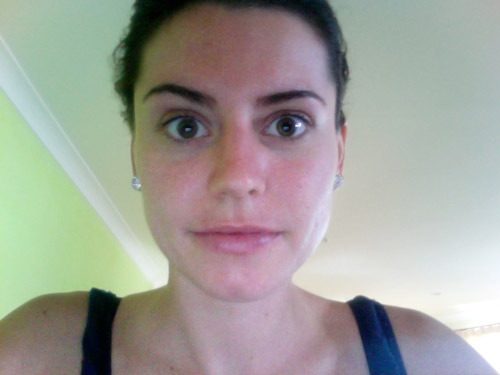 Let me tell you about a tool that I have discovered to achieve the most amazing skin with or without make up. It is called the Baiden Mitten and it is a glove that deeply exfoliates and massages the skin. It is such a simple tool that when I first saw it I did not see how it could do anything for me. I thought that it was just another scrubbing glove that I already had an impressive collection of. So I had my mother raving about it to me for over a year but I just didn't believe a piece of cloth would make any difference. And since I had such a long history or skin problems, I really didn't want to come across another 'miracle' product, which got my hopes up and in the end left me disappointed. The first time I used the Baiden Mitten, I realized this piece of cloth was FAR from useless. So as previously mentioned, I've had a long history of skin problems. Bad teenage acne, dryness, red skin. √ Swelling (beats me why I used to have this!) - this caused my eyes to water and shrink (see pictures below. 24-hours post first use when my skin settled after the scrub...I never had the swelling or red skin again. 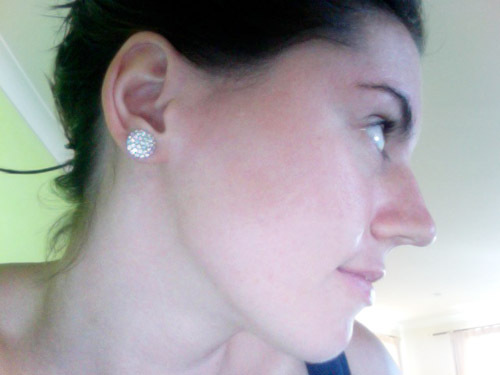 After about 3 months, the scars became almost invisible and my skin was completely manageable. My large pores and oiliness disappeared. 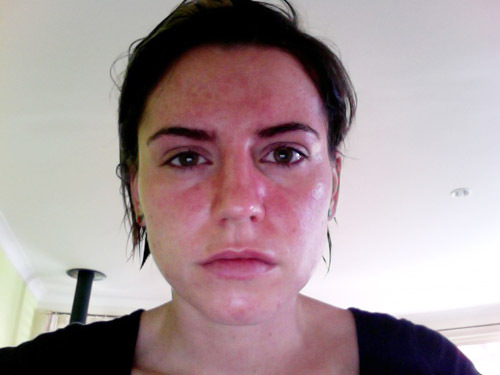 My skin was so dry, blotchy, itchy, painful. Putting any make up on just made my skin look worse because I looked like a giant cake face with any foundation on! I'm not saying this is a result that everyone will get. 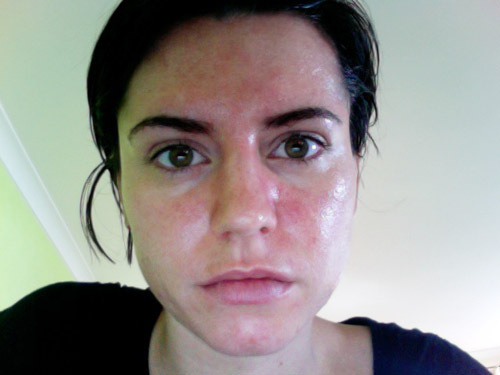 You may have completely different skin problems then me - better or worse. But from the feedback we are getting for the mitten, it seems 90% of women are loving this tool. Search the Baiden Mitten on Google and you won't find one negative review. Two years down the track I have a perfect Pin Up Skin not only on my face but over my entire body as well. It's basically like a beauty salon procedures (eg. 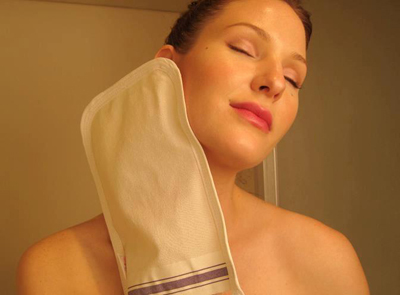 microdermabrasion), all in the comfort of your own home - for your entire face & body! This would cost a fortune at a beauty salon! And yet you can get the same...or better results at home with a mitten that lasts you around 18 months. "Pfft...yeah right. No way a piece of cloth would do anything for me". And I totally get where you are coming from! I would probably have to call myself one of the biggest skeptics in the world. I went through a stage where I didn't believe fridges worked (yeah I know...don't ask). I don't trust doctors or almost 99% of medications on the market. And this list goes on. But look around my website...you won't find me shoving crappy products down your throat. Only a small handful of things I have personally tested and love. The wonderful Sorelle sent me an awesome beauty tool that I would have to say was a miracle receiving. It's called the 'Baiden Mitten' I wish I bought it long ago. This is going to sound like a proactive endorsement but my family and friends know that I wouldn't put my word and name to something unless I truly believed in it. No chemicals and no creams, just a mitten that you can use over and over again- by just washing it! I am against the harsh chemicals they include in off the counter products and this is my solution to just that. As you all know my day job is restoring and revamping vintage furniture- I use 2 pack enamel, spray guns, spray cans and when I leave my shed for the day I am always covered in inch thick paint- usually black.. I generally go straight home and try my best to scrub it all off and... well I thought I was getting it all off until I used the Baiden Mitten and noticed I was about 4 shades lighter on my arms and my skin is all silky... now I look back It looks like I had a tan! A dirty tan. I have always suffered with pimples.. mostly from the Aussie heat and working outside and my face mask I always use is around my 'T' zone.. and then on the weekends I'm wearing full on Pin Up makeup and I could never get it looking smooth- it was like a never ending battle.. I love my job.. but I needed a solution.. so my 2 different worlds could come together and I felt confident in both. It's been just over a month of using the Baiden Mitten twice a week.. my skin is clearer than it ever has been, my skin color is consistent.. I always noticed my face was darky than my neck and I had to fix that with a lot of concealer…to think it was just the days grime sitting on top! There is no harm in trying the mitten, Sorelle offers money back guarantee.. you will be amazed how much 'dirt, grime and dead skin cells' just scrub away when you use it for the first time.. the more you use it the less you see…"
The mitten is made up of specially woven bamboo which grips the top dead skin layer that we all have and scrubs it away revealing the bottom, healthier and smoother skin. However all you did was scrub the skin hard which means the skin isn't repairing itself but improving itself. Secondly, the scrub encourages highly oxygenated blood to come up to the surface, which provides great nutrients to the skin making it glow even more. So, I was over the moon with my results...and I just knew that I had to get the same results for my readers, so I contacted the company and convinced them to offer a free shipping worldwide. It is just too good, especially for achieving perfect pin up skin. This is a must. I was skeptical, but after using the mitt myself I can see that those are real results. PS. It's quite unusual to find a single product can take care of 99% of all your skin problems all over your body. Try it...if what we promise, we didn't deliver there is a 100% money back guarantee. You'll finally be able to ditch all your expensive "miracle" creams & gels with the Baiden Mitten. Save time, money and start looking and feeling beautiful within a week! YAY! You can have amazing skin starting in just over a week. 1. How long does the mitten last? 2. How much does the mitten cost? 3. Does it affect tattoos? 5. Can it be used on acne? It is recommended you don't use it on active acne as this will spread the bacteria, however you can use it on non affected areas which will clear the pores there and may prevent any future outbreaks to occur - eventually you can end up with clear skin all over. What's the difference between using this and a normal wash cloth? hi im 19 and have acne and acne scar issues please help ! do you know what keratosis pilaris is? Is it better to use it while you're taking a shower? Or is it better to use it after?